Alvin, the dad, and Macy, the daughter. 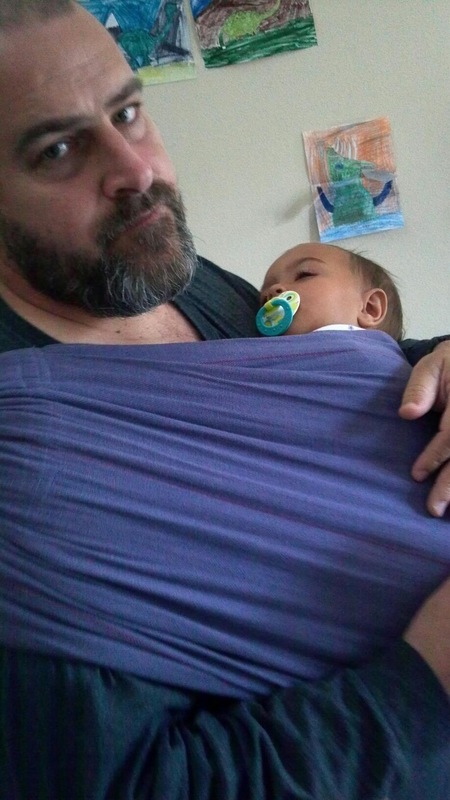 Wearing my wife’s trusty ring sling. Early March of this year, 2013. Macy wasn’t feeling well and my wife was out. I thought holding her would suffice, but I was wrong. She wriggled out of my grip, walked over to her mother’s stash of wraps, and selected her favorite. Unfortunately I’ve not put in the time or effort to be proficient at wrapping, so I had to resort to the next best thing and donne the purple ring sling. That’s exactly what she wanted and needed at the time, and I’m glad my wife has educated me on the benefits and joy of babywearing.